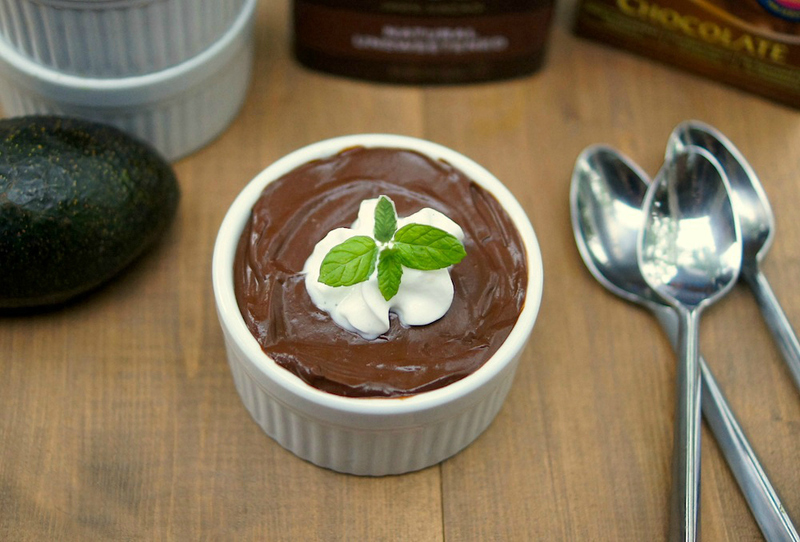 So, I’ve seen chocolate avocado pudding on lots of my favorite blogs over the last few months, + while it always looks delicious, I’ve been reluctant to try it. I love avocados (in guacamole, in pasta, etc.) + I love chocolate, but together? I had my doubts. But, when I had a few avocados quickly getting ripe + was craving something sweet the other day, I decided to (finally!) give this intriguing pudding recipe a try. So, how was it? Pretty flippin’ delicious! I’m not going to say that you can’t taste the avocado at all, because in this version at least, I could taste a subtle avocado flavor. As an avocado fan, I actually liked that. But would I try to sneak this by an avocado hater? (like I did with my beet-hating husband + this awesome chocolate beet cake?) – nope. That being said, it was delicious – wonderfully rich, chocolatey, smooth + creamy, with just a hint of awesome avocado flavor. And, because of the ingredients, it’s vegan, gluten-free, + has lots of heart-healthy benefits. Win! That is actually a pretty common debate amongst vegans and vegetarians, whether honey is vegan or not. Rather than get into the debate here, I’ll just say that if you don’t eat honey, there are many other vegan options for sweetening this pudding – vegan sugar, molasses, stevia, date sugar/paste, agave syrup, yacon syrup, etc. Thanks for stopping by! I am not vegan, nor vegetarian. But I eat real foods. I just made this avocado chocolate pudding for me & My Hunny for lunch. It was super easy and tastes absolutely DELICIOUS! I added 1/4 tsp of almond extract, and garnished with a drop of raspberry spread and a light dusting of powdered sugar. I made this pudding last night for our guests. It was a big hit. I will be making it again! So glad it was a success, Barb! This pudding is so delicious! Im going to buy avocados more often now. i halved the recipe and did use agave syrup. Simple, quick, and delicious. Yay, Rachel! I’m so thrilled you liked it!! 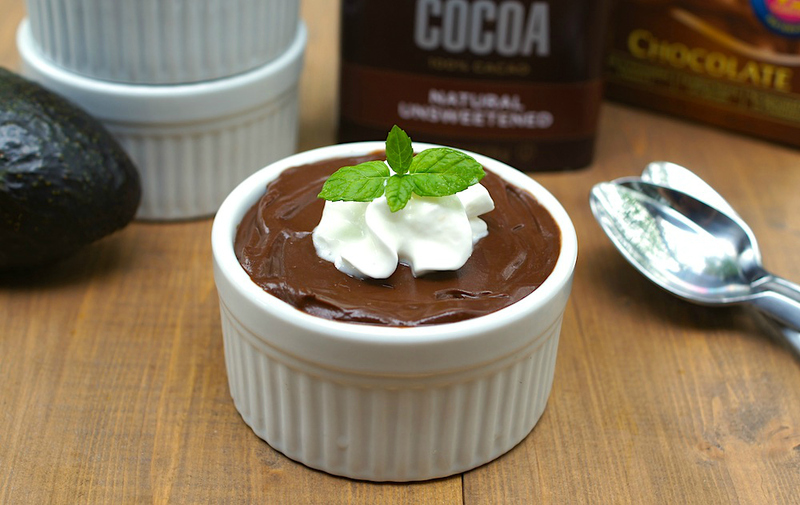 Oh my goodness I just made this delicious chocolate pudding and I am amazed it is fabulous! The bigger deal for me is that I hate avacado! Due to the fact that my three year old son is now on a grainfree diet I have been looking for innovative kid friendly recipes. All I have to say is that I was pleasantly surprised. I will never buy instant pudding again and have a slightly different view of avacadoes:) Thanks so much for sharing!! Hooray, I’m so happy it was a success for you AND your little man! Oh my gosh! This tastes amazing! My husband and kids love it! Awesome, Kim! So glad y’all love it!! I made this recipe exactly as you with honey and chocolate almond milk. I found it rather enjoyable. I have recently been dairy free due to my 5 1/2 month old’s whey allergy, and I miss the comforts of food like this! I didn’t think I could taste the avocado at all, but I greatly enjoy them and maybe it wasn’t a thought. If you are used to box pudding, this is definitely way different, but wonderful none the less! How many calories would say id in this? Hi Mariah, It will vary somewhat depending on what type of almond milk/cocoa powder/etc. you use, but roughly, the entire recipe has 540 calories, which means that each serving has about 270 calories. Hope that helps! YUM! Great recipe – thank you! Have you ever tried freezing this? I’m not sure how it would freeze/thaw due to the avacados, but I have a couple VERY ripe avacados, so I might just try it! Hi Sheila, I’ve never tried freezing this, but I don’t see why it wouldn’t work! I think you could definitely make a double (or triple, or quadruple) batch + freeze it in whatever portions work best for you. =) So glad you enjoyed it! Made this the other day. My son who hates his vegetables loves this pudding. I told him I made it with avocados and he told me to stop tricking him. I used honey because I didn’t have agave nectar. Will make this again! Awesome, Sefora! I’m so thrilled you loved it! Thanks for the tip, D! This is amazing! I like to use dark cocoa and reduce the sweetener by 2 Tablespoons. I usually double the recipe – and if you can get it into the fridge before you devour it, it’s really good really cold! I also like to add sliced almonds and sea salt! My 4 yr old loves it, and I make it at least 2x/week – since it’s so healthy I don’t mind serving it to her as a “treat”. We even gave your recipe to her preschool and the kids all made it and and loved it! Great astrology article! This is the type of information that are meant to be shared around the net.